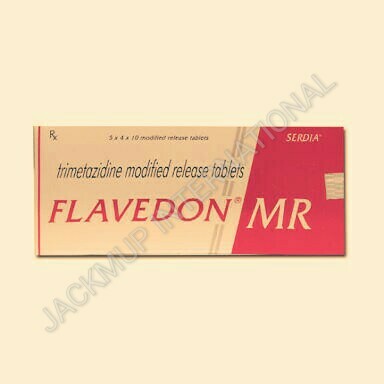 Description:- Flavedon mr 35mg tablet is used to prevent angina. It decreases the oxygen requirement of the heart by shifting its metabolism from fats to glucose. As a result, the heart works more efficiently. The Trimetazidine may cause dizziness and lightheadedness. To avoid this, get up slowly after sitting or lying down. Avoid driving if you feel dizzy after consuming Trimetazidine. Notify your doctor immediately if you are or are planning to become pregnant during the administration of this medicine. Do not breast-feed while taking Trimetazidine.